The iPad is perfect when it comes to pulling up recipes in the kitchen—my wife and I do it all the time, actually—but sooner or later you’re standing there with slimy hands and a snoozing iPad screen. Now what? 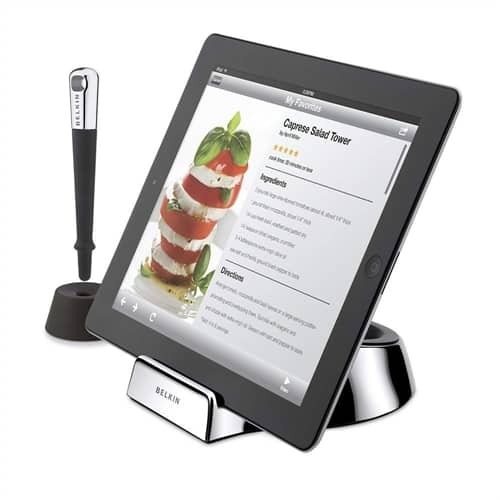 Enter Belkin and its brilliant new iPad chef stand ($40), which comes with a “non-slip” rubber base and its own, “kitchen-safe” stylus. The chef stand (which I’ve yet to see in person) props up the iPad at two different angles, according to Belkin, while the stylus lets you tap and swipe without mucking up the iPad’s screen. Even better, the stylus’ magnetic tip lets you wake the iPad 2’s display from “sleep mode” with a light touch, while owners of the original iPad can go ahead and tap the physical Home button. One you’re done cooking, you can wash both the stylus and the stand in warm, soapy water, leaving your precious iPad gunk-free. Great idea—and indeed, I think I want one. Looking for more iPad tips and how-tos? Click here!